hello, my name is Nora. I need a moment plz…umm…I’m an orphn, &…I was a daughtr & a mothr…& a wife. grr. but I was NEVER a philsopher. I’m not very kind…or ladylike…hardly maternal, 2b honest. I gues I’m not a warm person, but I hate the cold! also hate pet names, like littl squirrel, littl turtldov…ugh. not a fan of kittens & spaniels either (the pet names/ the pets). but I could b ur littl animal…if u don’t mind a liar. ::sigh:: I just wish we could talk. if u don’t call me by the upcoming Sunday (10/2 at 4pm & 7:30pm), I’ll b frozen & dead. xoxo, urs, Nora H.
it makes your hair stand on end and your toes curl. due to its sticky trail. …but that’s old wives’ tales. Schumann recognizing a woman in desperate need of a song cycle. In case it isn’t clear yet, let me give it to you straight: MODEL LOVE is not your grandmother’s FRAUENLIEBE UND -LEBEN. In fact, there are some surface similarities between the two song cycles: both works are composed of eight songs. Both begin with a piece about the marvel and mystery of attraction. And both come to an end as the singer confronts painful realities about a long-held dream of love and relationship. 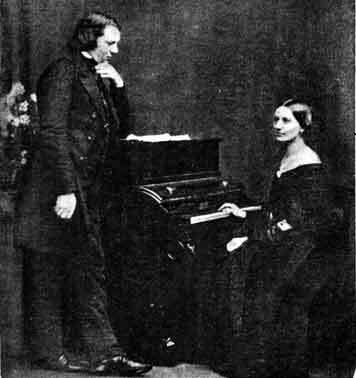 But, where Schumann’s Frau sings sincerely of the joys of marriage and motherhood, the Men and Woman of MODEL LOVE have a very different story to share: of the darkness of hungers long-unexpressed and what happens when we forget how to connect. Has Ms. Daedone uncovered the cure for the insatiable hunger that lurks within? We don’t pretend that MODEL LOVE can answer that question, but we do plan on giving you one hell of a good show. Session number two of Composers & the Voice! Lots of fun and good energy in the room! We started out with two hours of improv with now-familiar face Terry Greiss. Terry led us in a number of very interesting exercises, my personal favorite of which was involved building ourselves into a machine. The way this was worked was this: One person would get an idea for a machine. He or she then stood and made a full-body gesture and a noise, acting as a distinct part of this machine. One by one, the rest of the class added on with their own gestures and noises until the machine had been built. Everyone had a different idea of what the machine was and what their part in it would be; the whole thing was fascinating. We also began scenework in a similar game. This time, however, there was no repetitive gesture or noise; Terry asked us to find an action and play it as realistically as possible. In this way, we are beginning to recognize the active dramatization of character. Terry got a little trippy this session. He asked us to put our hands a little apart, palms facing together, and try to understand the space in between. For many of us, that space became very physical. Terry then had us combine our individual spaces with other individual spaces until the whole class was holding one space. A few people ventured inside the space. Ronnie was surprised and amazed to find that she actually felt the space. Mika raised a great discussion: How does improv relate to us as composers and librettists? Terry explained the importance of openness and vulnerability in art, and how understanding physicality can greatly enhance our ability to realize character. After a short break, Steve had a little Q&A for us about the program in general—very helpful! We then dove into our very first acting class with Kathleen Amshoff. Kathleen got to know us a little (have any of us acted? It turns out most of us have some performance experience, and Rachel has a degree in theater, and Daniel is actually a professional actor and singer!) and then we began doing some very intense exercises in partnering. Kathleen had us make eye contact with a partner for an uncomfortably long period of time, after which we closed our eyes and she asked us details about our partner’s physical appearance. With the same partner, we were then asked to make eye contact and, alternating, very calmly tell the other person how we felt (ie, “I feel hungry.”). It was surprisingly difficult to come up with feelings to feel, or at least to say out loud. Kathleen then had us line up across from a different partner and, again making eye contact, step forward or backwards as it felt right. Zach and Steve looked, in Kathleen’s words, “like [they] were playing chess.” Sidney and I felt like we were doing a tango. Ronnie and Rachel had a more emotional connection, feeling rejected when the other stepped back, and Daniel and Mika found themselves looking for patterns. All in all a fascinating experiment. Excellent session! Only two weeks till the next!! And they’re off! Monday, September 12 was the first day of the Composers & the Voice 2011/12 Workshop Series, and it was a long invigorating day. More on that below. This blog post, and the ones that will follow more or less every 2 weeks, are intended to serve two purposes. First, they will provide an ongoing forum for discussion and reflection by the 8 Composer and Librettist Fellows, as well as the Artistic Team— a place where ideas and questions that came up during the workshop session can be investigated further. Second, these blog postings will provide the greater AOP family, and new opera enthusiasts everywhere, a glimpse into our workshop room. The workshop day began at 3:00 with a quick orientation session, but then dove right into the fray with the first of our 9 Improvisation and Theater Games sessions, led by Terry Greiss of the Irondale Ensemble. I first met Terry 23 years ago (yikes!) when I began a semester-long internship with Irondale– the final part of my undergrad degree at Drew University. I ended up working with Irondale for close to 5 years, and so much of what I learned through my immersion in the company’s use of improv and theater games as tools for generating theatrical material, as well as building strong cooperative teams, continues to have a profound influence on my day to day work today. 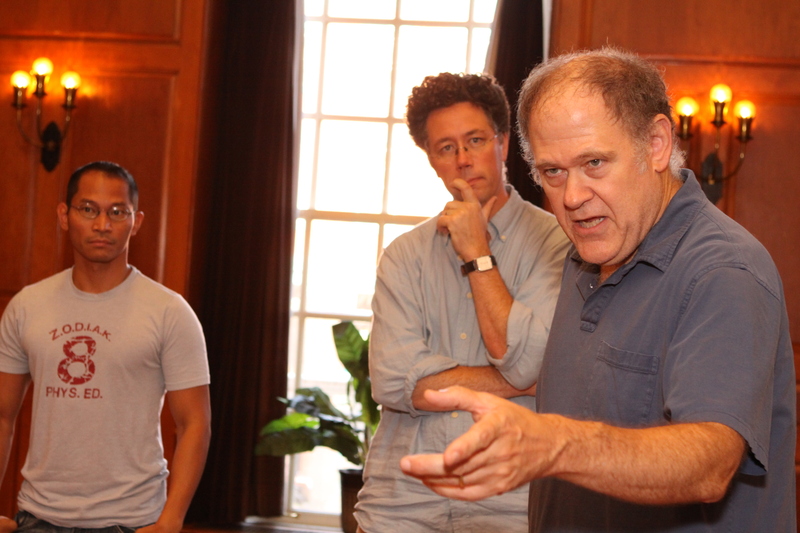 Instructor Terry Greiss leads an improv session while composer Sidney Marquez Boquiren and C&V Artistic Director Steven Osgood listen. My advice to the Composer/Librettist Fellows going into this course of Improv study was to dive in, play the games, and not to worry about how this all relates to the writing process. It was great fun to sink into the high-energy full body challenge of Zip Zap Zop, and Mind Twist. I found Chair Tumble to be an intriguing look at how difficult it is to TRULY risk falling down. One Word Story, One Word Fairy Tales, and String of Pearls had our group of 10, who had just met an hour earlier, building stories together with the freedom to respond intuitively. I think I was messing with the CD player when Terry was giving instructions to Upside Down Drawing. While everyone else copied surprisingly skilled portraits of Igor Stravinsky, I was having a blast more or less coloring mine in. Ah well…. One Word Letters/Scenes and Tell Me about the Time got us all out of our heads, and investigating a greater freedom of telling a story. 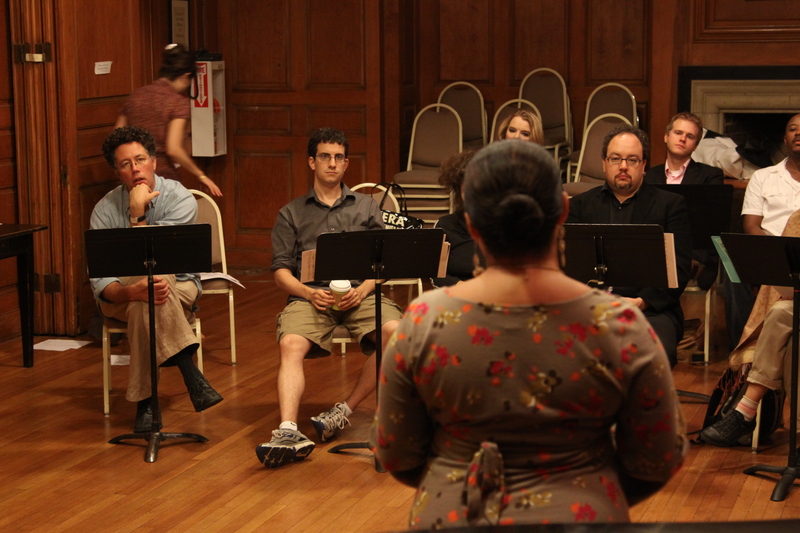 Soprano Andrea Arias-Martin sings for the 2011-12 composers & librettists. After the dinner break we were joined by the Music Directors and Singers who we will be working with throughout the season. Each of the singers had about 25 minutes to sing and dissect three arias that they feel are perfectly suited to their particular voice. I love this session, and the look it gives into how each singer approaches singing, how difficult it can be to express in words this most elusive of physical acts, and how wonderfully these particular singers can articulate the process. It is the crash-course part of Composers & the Voice, after which things relax a little as each composer gets to write for the singers one by one. Once 10:00 rolled around, it was time for a glass or two of Riesling. Next Session– September 26. Just composers and librettists. Improv 2, and Acting 1. You are currently browsing the Have a Voice blog archives for September, 2011.